With Hanukkah already behind us, perhaps this post is a bit tardy. Regardless, the arbitrary ground rules are “things that aren’t immediately consumable,” so a bottle of Grey Goose is out. Here are a few drinking related gifts, mainly aimed at guys, but that’s not to say that there aren’t some gals out there who wouldn’t enjoy them. Engraved flask – So many uses, but my favorite anecdote about a flask comes from a friend who moved to London after college. He was so disconcerted that their mixed drinks were both expensive and weak (premeasured to 30mL or about a shot), that he solved it by re-spiking his whiskey and cokes with extra whiskey, smuggled in via flask. A brilliant idea, but be stealthy or risk getting tossed. Pictured is the $25 “Bobcat” from eFlasks, where you can get them engraved. The leather works well for using this outside in the winter cold. Should be used more often as a groomsman’s gift. 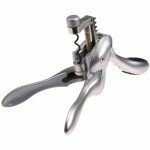 Wine Opener – The basic ones work well enough, but if you’re going to spring for something, you could go with the semi-automated route, where the Oster checks in highly. Personally, I’m not a huge fan of random clutter plugged into the kitchen, so I prefer the Metrokane Rabbit. It’s not automated, but is an impressive (and elegant) looking piece of machinery. Its leverage is akin to cutting down a weed with a chainsaw, which seems like a very American approach. Homebrew Kit – I don’t own one, but that has to changed in order to realize my vision of home-brewed, awesome tasting, low-carb, highly-efficient beer. It seems like a sure bet that unless I figure out how to do it, it isn’t going to happen. 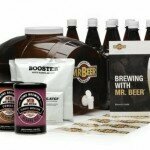 Mr. Beer Premium Gold Edition Home Brew Kit seems like the way to go, for the novice. Beer of the Month Club – I’ve never gotten anyone this, but it seems like an awesome gift to get. I like this one, because they have a nice clean website with history that tells me that these are craft beers that aren’t so easy to acquire. Wine of the Month Club – Wine clubs seem like a super competitive industry. It’s a great markup, for a product that is generally well-traveled. I can go to a local liquor store and have a reasonable selection of Chilean wine, which is sort of absurd and not the case with beer (in terms of distances traveled). Regardless, a wine club membership would be preferable to a random gift that won’t be used. A quick Google search gets you spammy sites and a few clubs themselves, but the few I checked out were a little too high end for this pauper’s tastes. I’m a big fan of the wine columnists at the Wall Street Journal, who try to dig up value in the $10-30 range, so I’ll recommend the WSJ Wine Club, which they advise. If I had to say there’s one book that I learned a lot from in the past year, it’s The Wine Bible. The first 80 pages are the best intro to wine that I could possibly imagine — if you can comprehend 25% of those pages, you can trick someone into thinking you’re a oenophile. The details on regions are great and although it was written 10 years ago, not too much has changed. Why is it oenophile? I had to look that one up. It should be vinophile. Blanco Basura Army Membership – That’s a literal translation to white trash for the Spanish-language inhibited. Since things that could be quickly consumed were off-limits, this brand’s 5 pack of beer and mini tequila bottle didn’t make the cut, but do make interesting additions to a holiday party. Naturally, the gear is the next best thing. Not only that, but you get stickers and VIP status, which is oxymoronic (VIP white trash), but Kid Rock has it down pat and Joe Dirt was good at it too. PBR trucker hats are so 2006. Jump on the next white trash wannabe bandwagon. This probably could’ve been more creative, but it wasn’t. Have you gotten a cool alcohol-related gift or want something that isn’t on the list? Please share in the comments section.